The overall site and general workflow can be symbolized with a pyramid structure. Gordon T Long’s Market Research and Analytics forms the base where all other work is derived from. He does extensive research on a daily bases; offering insights and analysis on a monthly cycle. 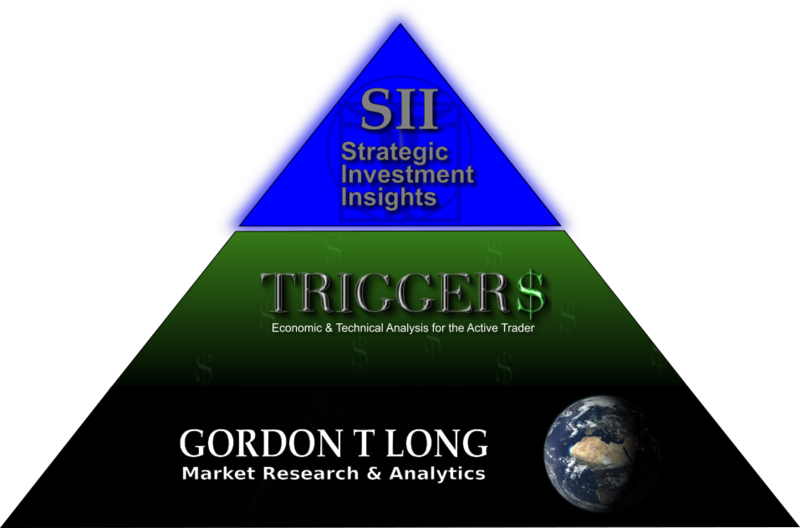 TRIGGER$ is a combination of “top level” research and conclusions from Gordon’s MACRO Research, and Technical Analysis & the HPTZ Methodology for major indexes, commodities, and FOREX pairs. Strategic Investment Insights are the “tip of the spear” and are the results (and point) of Gordon’s macro research and TRIGGER$ charting. These offer market sectors, specific instruments and technical charting for a comprehensive actionable watch list to add to your due diligence. MATASII.com is for educational, research and demonstration purposes only. TRIGGER$ Media Publications, MATASII.com and it’s main contributors are NOT licensed investment advisers. Content is not investment advice, nor a recommendation to participate in the markets. THIS SITE AND IT’S CONTENTS ARE MEANT TO BE ONE PART OF YOUR OVERALL DUE DILIGENCE. Please see our full Terms & Conditions, subscribing to the site means you have read and understood them. MATASII.com, Strategic Investment Insights (SII’s), TRIGGER$, and Gordon T Long Market Research and Analytics are NOT a “chart service” provider. We offer Market Analytics and Technical Analysis and use charts to demonstrate and showcase our work. TradingView.com IS a “chart service” provider and this is what we use for our charting. While the charts on the site are dynamic and updating, they are NOT real time feeds and should not be used for trading. The purpose of the charts is to demonstrate the High Probability Target Zones (HPTZ) methodology and the technical road map it creates for subscribers. What’s the difference between BATS data and data from other exchanges? BATS is an electronic exchange that doesn’t charge per user fees for real-time data. The data is slightly different from the “official” data from other exchanges – it offers approximate volumes and fewer price updates. Again: This site provides technical analysis and technical charts, and uses dynamic charts through TradingView to do this. We ARE NOT however a “chart service” provider. TradingView IS and they are who we use for our charting services to show our work on this site. Everything You See on the site! SII Strategic Investment Insights, TRIGGER$ online monthly publication and Gordon T Longs Market Research & Analytics! The end result of Gordon T Long’s Market Research & Analytics, synthesized with Andrew J.D. Long’s High Probability Target Zones technical methodology. Strategic Investment Insights identify areas of the market that are expected to have a reaction in today’s global climate and what that bias is. Each SII has it’s own watch list of securities that warn when potential entry considerations (technical) are near. Every product in the watch list links to a chart and potential technical set-ups. TRIGGER$ summarizes the vast amount of market research done by Gordon each month, including research and articles written specifically for TRIGGER$ by him. Global Macro Research is synthesized with advanced and proprietary Technical Analysis for Indexes, Currencies and Commodities, giving a full market profile. Technical charts and the High Probability Target Zones (HPTZ) methodology can be found for the SPX and other indexes, VIX, Gold, Silver, Oil, US Dollar, and major Forex currency pairs. Global Macro Market Research and Analytics. Through his process of Abstraction & Synthesis Gordon scours the mainstream and alternative media for clues on current and future market conditions. MATASII is the repository for his research, updated daily with articles and posts he finds meaningful and relevant. Read what he is reading! Gordon’s MATA and other research documents are now in an online format. His publication cycles continue as he gives an analysis of the research on a monthly basis. GO HERE for examples of Gordon’s work and what you can expect to see from him. Gordon T Long: Macro Analytics has an extensive research section. The items posted here are not original material. This is material gathered from across the web that is then organized and used in the Abstraction & Synthesis process. Gordon reads hundreds of posts/information daily from alternative, mainstream, government(s), and other analysts sites. Information he thinks is important is then “pulled” and added to the research section. Research is organized in to Tipping Point categories and then from here he starts to make his associations and the synthesis process begins. This research is shared with you, and you can read what Gordon is reading, what he sees as important. The material found in the research sections of the site is not original nor is it meant to be. It is public information that can be found from across the internet. That which we feel is important is captured and organized, giving you a research center of your own.